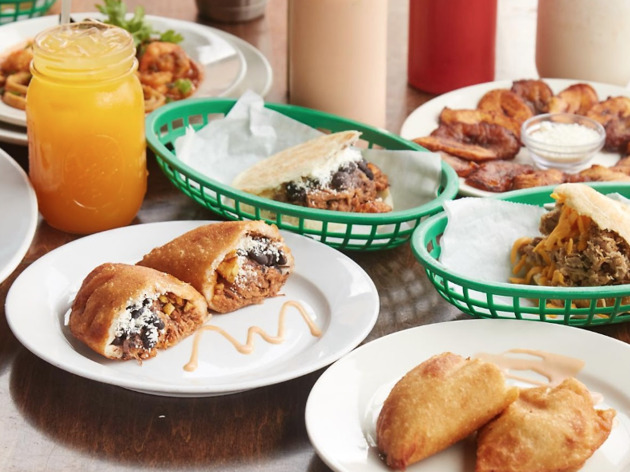 Get your empanada and arepa fix at this bright 30-seat café outfitted with colorfully painted walls and Italian ceramic-tile floors in Bed-Stuy. Choose from Latin American specialties, like pabellón arepa (shredded beef, plantains, black beans, salty white cheese, $7), grilled king fish with rice and plantains ($13) and tostones (fried green plantains with cheese, $7). Guacuco’s menu also includes plenty of empanadas with fillings ranging from ham and cheese to shredded fish (both $5). Traditional desserts like flan and chocolate cake with tea biscuits complete the meal (both $4). Wash it all down with cocada, a frozen coconut shake ($4) or beet-carrot-orange juice ($6). 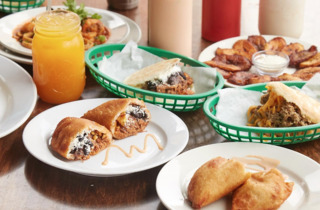 The best goddamn arepas and empanadas that you can get for $10 per head! The portions are pretty generous here so an order of two arepas and a side of empanadas is more than enough for two greedy people. The beef arepa is especially tasty and is great washed down with the amazing coconut milkshake (their words, not mine but a truth no less).